Gasco Calibration Gas Cylinder with Carbon Monoxide (CO) 50 ppm and Pentane (C5H12) 50% LEL. Balance Air. Available Sizes 17, 34, 105 and 221 Liters. > NON-REACTIVE MULTI MIXTURES > CARBON MONOXIDE + PENTANE : 3 Items found. Gasco Calibration Gas Cylinder with Carbon Monoxide (CO) 100 ppm and Pentane (C5H12) 25% LEL. Balance Air. Available Sizes 17, 34, 105 and 221 Liters. 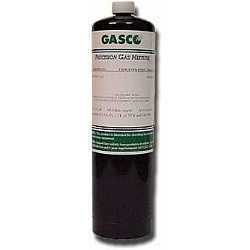 Gasco Calibration Gas Cylinder with Carbon Monoxide (CO) 200 ppm and Pentane (C5H12) 50% LEL. Balance Air. Available Sizes 17, 34, 105 and 221 Liters. (DRAEGER 4594947) Gasco Calibration Gas Cylinder with Carbon Monoxide (CO) 100 ppm and Pentane (C5H12) 30% LEL. Balance Air. Available Sizes 17, 34, 105 and 221 Liters.